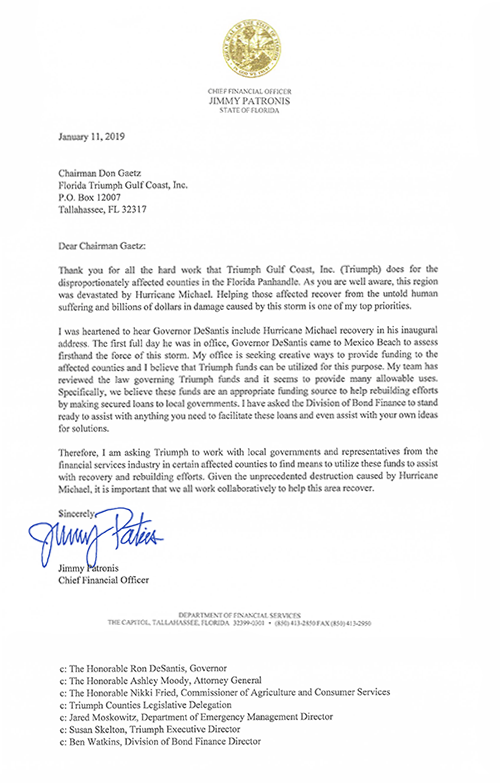 TALLAHASSEE, Fla. – Chief Financial Officer (CFO) Jimmy Patronis sent a letter to Triumph Gulf Coast, Inc., prior to their board meeting this afternoon regarding Hurricane Michael recovery efforts in the Florida Panhandle. “Since Hurricane Michael ravaged the Panhandle and left both residents and businesses devastated, I have worked to find innovative solutions to rebuild this area better and stronger than before. I have asked Triumph, Inc., to work with local governments to utilize funds to assist with recovery efforts and provide needed relief and financial assistance to help these impacted communities,” said CFO Jimmy Patronis. Triumph Gulf Coast, Inc., is a nonprofit corporation organized to oversee the expenditure of 75 percent of all funds recovered by the Florida attorney general for economic damages to the state that resulted from the 2010 Deepwater Horizon oil spill. Triumph Gulf Coast, Inc., is required to administer the distribution of the funds to be used for the recovery, diversification, and enhancement of the eight Northwest Florida counties disproportionately affected by the oil spill.